The Hound Dog is renowned for its ability as a hunting dog, having incredible stamina and focus! Hound dog breeds were primarily used for hunting. These hunting dogs are well know for their incredible ability to find and track prey. They hunt using a keen sense of smell or incredibly sharp sight. Each hound dog breed is either one of the Scent Hounds, one of the Sighthounds, or a hound dog that uses a combination of scent and sight like the Spitz hounds. This is a very diverse group of dogs, not only in size and appearance, but also in the types of pets they make. On type can be affectionate and playful while another type can be more aloof and distant. It is important to learn about the type of hound dog you are attracted to, to make sure it will make a good fit in your life. Dog Breed Information: Hound dogs hunt either by sight or sound, but they all have one trait in common, stamina. Many make exceptional pets, but no matter which of the hound dogs you keep as a pet, they all have the inborn instinct that comes from being hunting dogs. If a hound dog catches a whiff of (or the sight of) a potential varmint, it may very well be off and running. There is nothing that makes a hound dog happier than sniffing out or sighting a varmint, and then pursuing its quarry. This is when it's incredible stamina will become apparent. This is also when a tendency towards stubbornness may also become apparent. These hunting dogs do not readily give up their pursuit. Dog Types: Popular Hound Dog Breeds Scent Hounds: A popular notion of a hound dog is that it is a mellow lumbering fellow. A dog with droopy ears and a nose snuffling about the ground, that is quite friendly and puppy like. This common notion is a depiction of a scent hound. Many of the scent hounds make wonderful pets. 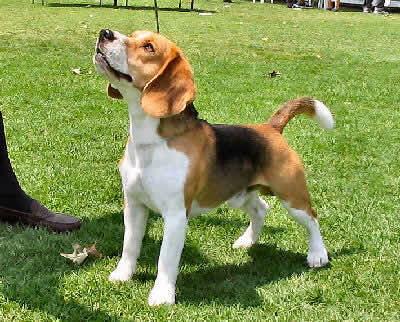 Especially noteworthy scent hounds are the Beagle, Dachshund, Bloodhound, and the Basset Hound. Others that are also strongly favored as pets include the Harrier, Petit Basset Griffon Vendéen, Black and Tan Coonhound, English Foxhound, Otterhound, and the Plott Hound. Sighthounds: The sight hounds are another commonly kept type of hound. Sighthounds are some of the oldest of the dog breeds and have been depicted throughout history as a nobleman's companion. As their name suggests, they hunt by sight, and then they course their prey. They are streamlined and powerful, swift, and keen of sight. Some of the most popular are the Afghan Hound, Irish Wolfhound, Borzoi, and Whippet. Others that also make fine pets include the American Foxhound, Greyhound, Norwegian Elkhound, Otterhound, Saluki, and the Scottish Deerhound. Spitz Hounds and other Scent and Sight Hounds: Other types of hounds are those that hunt by both scent and sight, and include some of the Spitz. Some of the most popular of these hunting dogs are the Basenji and the Rhodesian Ridgeback, as well as the Ibizan Hound and the Pharaoh Hound. The Basenji is a Spitz hound that is highly skilled in both sight and scent. Spitz dogs can be identified by their pricked ears, a ruff around the neck, and a tail that curls up and over the back. Other well known Spitz dogs are the Elkhound and Finnish Spitz. Dog Care Tips: Knowing the type of Hound Dog you are getting is very important, These dogs vary in their behaviors and in the ease of keeping them. Those that traditionally hunted in packs usually get along very well with people. Yet some are so wired to the hunt that they have difficulty focusing on obedience training. Each Hound Dog will also have its own set of care requirements. Hounds are known for their stamina and tenacity in pursuit of their quarry, and they are solidly built dogs. But the physical appearance of each type varies and reflects the type of hunting dog are designed for. These physical attributes can require special care. The long ears and facial wrinkles on the Scent hounds are prone to infections and need to be cleaned regularly. The large Sight hounds are built as runners, and will chase after anything so need to be leashed or securely fenced. Their deep chests make them subject to bloat, and they are sensitive to anesthesia. As large breed dogs, hounds they tend to be short lived.